A Companion to Ovid is a comprehensive overview of one of the most influential poets of classical antiquity. Features newly commissioned chapters by noted scholars writing in their areas of specialization. Illuminates various aspects of Ovid's work, such as production, genre, and style. Presents interpretive essays on key poems and collections of poems. Includes detailed discussions of Ovid's primary literary influences and his reception in English literature. 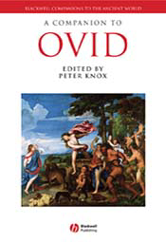 Provides a chronology of key literary and historical events during Ovid's lifetime.